Choosing the right partner for your organization’s needs can always be a daunting task. Not only is finding one that meets all of your qualifications necessary, but you also want a partner that is flexible and will be able to adjust as your organization changes. 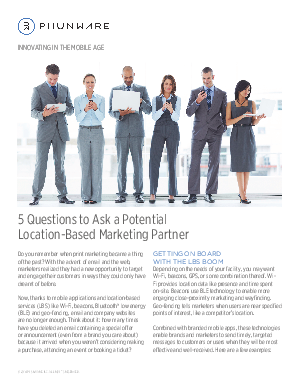 Download this whitepaper to learn the 5 questions you should be asking a potential location-based marketing partner and see how it will allow you to understand and engage your customers more deeply than ever before.